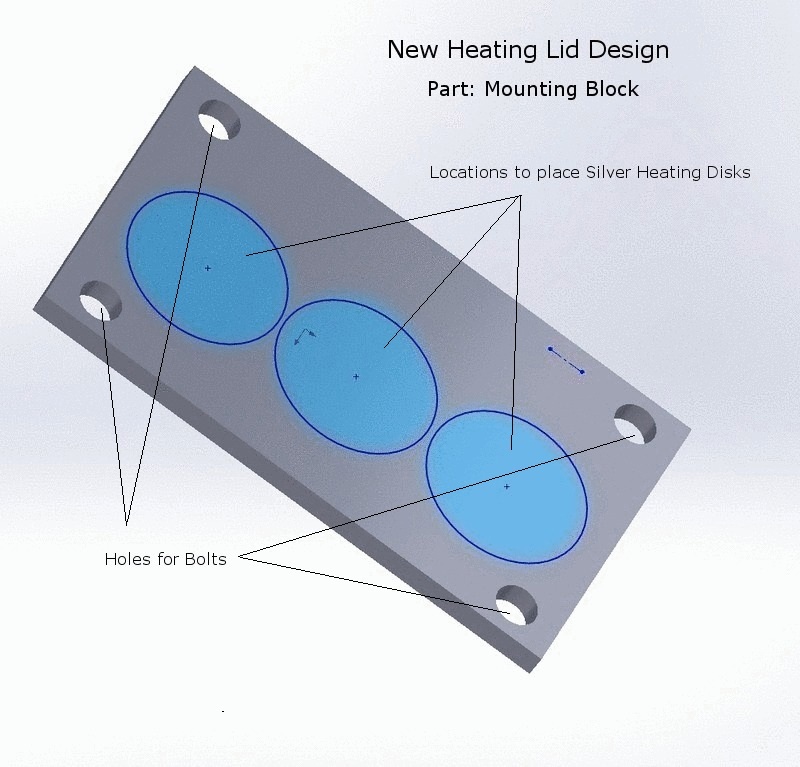 To create a uniform and faster heating system, replacing a rectangule heated block with three heated silver discs that will more efficiently and more quickly heat the system through rotations during cycles. 3 silver heating discs that allow a faster heat/cool rate, that will be heated to different temperatures. A rotating system that will rotate the discs for each cycle to optimize PCR time. As one disc heats, another cools in preparation for the future cylces and vice versa. 1. 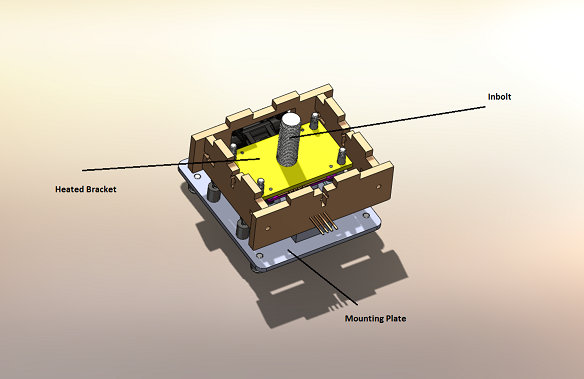 Find the 3 heated silver discs and fit them into the mounting rectangular plate where the cutouts are. 2. Take the adhesive off of a white insulation circle and then place it over a heated disc so it overlaps and hold the discs in place. repeat for other two. 3. After the heated lid bracket has been assembled, attach the mounting rectangular plate with heated discs onto heated lid bracket by screwing the shoulder bolts on with the blue allen wrench. 4. Attach this piece (lid casting) to the assembly with 4 black screws. Note: Make sure the discs fit in the mounting rectangular places correctly and that the insulation completely covers them with no air bubbles underneath otherwise it could break during cycling. Note: The discs will be rotated by the handle on top. as the knob for the heated lid handle is turned, the heated discs will move. The discs need to be turned for each cycle, to effectively heat or cool the DNA. Although this process takes away from the autonomous aspect of the PCR machine, the system will work more effectively and quickly overall. The changes we made to our PCR machine include the additions of a new lid with multiple heating blocks, rather than just one, and of a revolving mechanism which is capable of holding multiple PCR tubes at one time. Multiple heating blocks allows for faster cycles because they eliminate the time it takes to heat/cool a mere one block repeatedly in order to replicate the DNA. Now, the test DNA can be quickly moved to preheated blocks without the lag time. Also, multiple DNA samples may be replicated at one time depending on the block temperature set-up and positioning of the PCR tubes in the revolver. By this method, literally an infinite amount of DNA samples can be replicated all at once, depending on the size of the machine of course. But, as far as our innovated machine goes, up to three separate samples may be run within a 2-hour period. The volume of the reaction remains the same as it was in the old machine, and DNA measurement must be done separately via a fluorimeter. 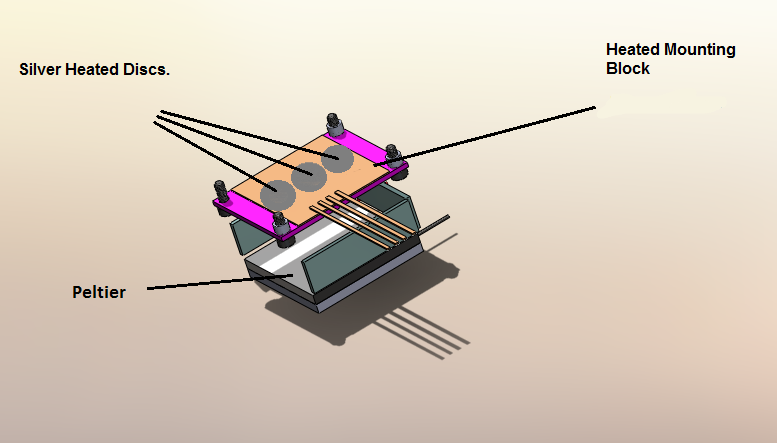 This new protocol is slightly different than the original; rather than setting one block to do all the work of heating and cooling, the new machine has multiple blocks which keep a constant temperature while the rotating mechanism (containing the DNA in a PCR tube) simply switches between them. This method is much faster as it eliminates the time it takes to heat and cool one block over and over again. In addition, the protocol remains nearly unchanged. The only difference in the protocol now is to set the specific temperatures, amount of cycles, and times to individual and respective blocks, instead of just one block. Also, it is imperative that the user indicate to the machine into which slot they have placed the PCR tube. There are multiple receivers for the PCR tube in the new revolving mechanism, so the machine needs to know exactly which receiver the user has selected. Otherwise, the machine will conduct the cycles on a PCR tube which is not present, meanwhile the slot which actually holds the PCR tube never sees the heating/cooling blocks. It is a menial addition to the programming of the machine, but can make a huge difference in the outcome of a trial. No changes were made to the method of measuring DNA. A fluorimeter is the best way to do this, and, seeing as no changes were made to the fluorimeter given to our group, the protocol remains the same. 1. The first step is to connect the camera phone to the computer that has an ImageJ already installed. 2. Choose where the smartphone listed can be found and then double click on it; this should be under “my computer”. 3. After opening the DCIM folder, select the camera. 4. The photos the group will be taking can be placed in a created folder. 5. Open ImageJ and locate the file and choose the option to open upon clicking on it. 6. You can keep opening different pictures after selecting browse then picking the picture for which your group must use. One of the genes we examined is associated with Alzheimer's Disease, a progressive neurologic disease of the brain that is the most common type of Dementia. In patients diagnosed with Alzheimer's Disease, Plaques, deposits of protein fragments that build up between nerve cells, and Tangles, twisted fibers of protein that build up inside cells, both develop within the brain which kills brain cells. Alzheimer's patients also have a deficiency of Neurotransmitters which are involved in the transmission of messages in the brain. All of this leads to the irreversible loss of neurons in the brain, which over time leads to the loss of intellectual abilities, specifically memory and reasoning. As the disease progresses, the loss of these abilities hampers social and occupational functioning. The second gene we examined is linked to Sickle Cell Anemia, the most common form of Sickle Cell Disease, a disorder in which the body literally makes sickle-shaped (or crescent-shaped) red blood cells instead of normal doughnut shaped red blood cells. Sickle cells contain abnormal hemoglobin, an iron rich protein that carries oxygen from the lungs throughout the rest of the body. This abnormality results in the sickle shape of the cells. Unlike normal red blood cells, sickle cells are sticky and stiff and do not flow through blood vessels easily, which often leads to the blockage of blood flow in limbs and organs, leading to pain, organ damage, and sometimes infection. In patients with Sickle Cell Anemia, the anemia part of the disease causes there to be a less than normal number of red blood cells in the blood stream. Since the red blood cells are sickle cells, they die much quicker than normal red blood cells and the body cannot make new cells to replace the dying ones fast enough. 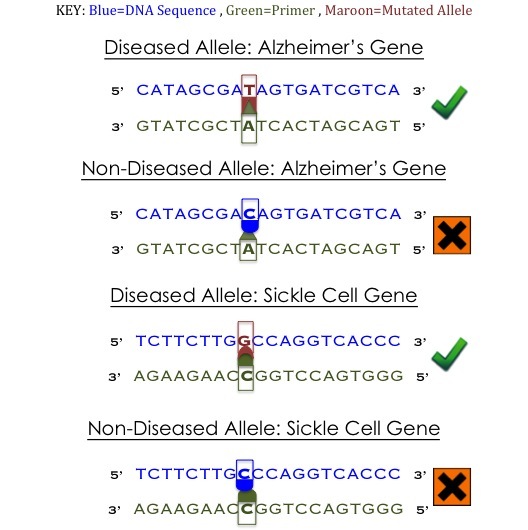 A disease allele will produce a PCR product because the mutation in a disease carrying sample would make the proper sequence to bind to the primer, whereas a non-disease allele that does not possess the specific mutated base (the C→T mutated base for the Alzheimer's gene and the C→G mutated base for the Sickle Cell gene) would not have the correct sequence to bind to the primer. The primers are also within the ideal 18-22 bp length and abide by the GC Clamp rule, proving that all of the primers would be effective. This page was last edited on 29 November 2012, at 14:58.